If you’re on the hunt for a high-yielding dividend investment in the banking sector, these five stocks are a great place to start. One of the reasons investors are often drawn to bank stocks is because they tend to pay generous dividends. But just like any other industry, some banks stocks are more generous than others when it comes to their quarterly payouts. Which are the best from the perspective of an income-seeking investor on the hunt for a high yield? You can find the answer in the table below. Here are the five highest-yielding big bank stocks, all of which yield more than the S&P 500. Data source: YCharts.com, The Wall Street Journal. There are three stocks in particular on this list that investors might want to consider. First and foremost is New York Community Bancorp (NYSE:NYCB), a regional bank based in, you guessed it, New York City. Not only does it sport an industry-leading 4.3% yield, but it's also proved to be one of the safest and most profitable bank stocks over the past two decades. After adjusting for splits and dividends, New York Community Bancorp's stock has climbed from $1.25 per share at the beginning of 1994 all the way up to nearly $16 a share today, according to historical price data from Yahoo! Finance. That equates to upwards of a 12,000% gain. Over the same stretch, the S&P 500 is up 370%. New York Community Bancorp has accomplished this by focusing on a unique niche in the banking industry -- financing rent-controlled apartment buildings in New York City. Because these buildings are invariably full, as they offer below-market rents, the buildings' owners default at a much lower rate that other types of borrowers. This has saved New York Community Bancorp from enormous losses even during the depths of the financial crisis. The one thing investors need to be aware of, however, is that New York Community Bancorp is diversifying away from this niche. This is largely due to its 2015 acquisition of Astoria Financial, which operates different business lines than its now-parent company. Also, because the deal pushed New York Community Bancorp above the $50 billion asset threshold, it became subject to the Federal Reserve's annual stress tests, which could constrain the bank's dividend in the future, as the Fed can now exercise veto power over the bank's quarterly payout. 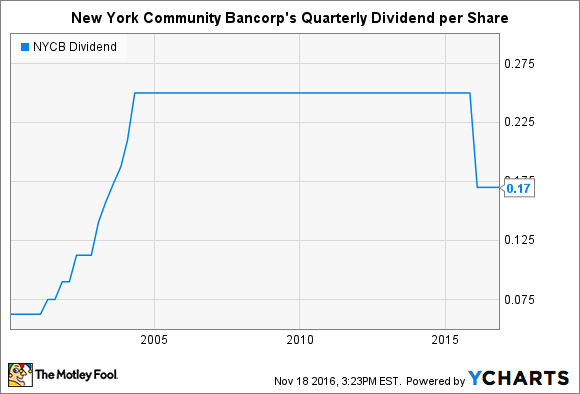 In the first time in over a decade, in fact, New York Community Bancorp last year cut its dividend from $0.25 per share down to $0.17 per share. The timing wasn't a coincidence, and it remains to be seen whether further cuts are in the cards. Either way, current and prospective investors in the bank should keep their eyes on this. NYCB Dividend data by YCharts. The second and third high-yielding bank stocks that are worth singling out are Wells Fargo (NYSE:WFC) and BB&T (NYSE:BBT). These are solid, stable stocks that any dividend investor can add to an income-seeking portfolio and not lose sleep over. Yes, Wells Fargo got into trouble recently for opening authorized accounts for its customers, which you can read more about here, but none other than Warren Buffett is Wells Fargo's biggest shareholder and has said unequivocally that he still considers it to be an incredibly good investment. BB&T is of the same ilk. While it's a large bank in its own right, with $223 billion in assets on its balance sheet, it's still a fraction of the size of Wells Fargo, which has nearly $2 trillion worth of assets on its balance sheet. This means that BB&T has more room to grow. Furthermore, as a much smaller bank than Wells Fargo, BB&T isn't subject to the same stringent regulatory regime that the so-called too-big-to-fail banks are. This allows BB&T to operate more freely than its larger counterparts and thus gives it a benefit in terms of profitability. In short, if you're on the hunt for a great dividend investment, then you might want to take a look at one of these five bank stocks with above-average dividend yields, with the three discussed at length being worthy of particular attention.